Back when I worked in the Chain Bookstore there used to be quite a few books that we would get in where all of us would exclaim "Who would spend money on this?!?!?". Usually the books were on strange subjects or just plain wacky and I used to think "This will never sell". But if there is one thing I have learnt from my time in book selling, it would be that you can NEVER predict what is going to sell and what won't. So many times the books that I thought would never sell literally walked off the shelf and were needing to be re-ordered within a week. None more so than a title we got in for our Bargain Books sale one June called Knits for Dogs, or Doggy Knits or something like that. I couldn't believe that anyone would waste their money buying this book, let alone waste their time knitting for a dog! Within 2 days of going on the shelf, we had sold out, and within a week the entire chain of stores around the country had sold out and people were wanting to special order it! I was gobsmacked! Which is why I wasn't surprised when we received advance samples of a book which is my pick for this weeks Book of the Week. 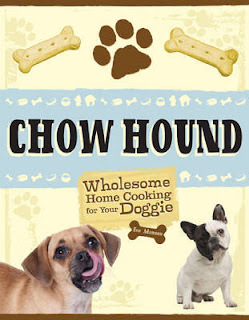 Chow Hound: Wholesome Home Cooking for Your Doggie by Eve Adamson is, as the title suggests, all about cooking for your dog. Now you may laugh, but this book, which is due for release next month, already has over 30 backorders! 30! At $19.99 (AUSRRP) it's actually not a bad little book if you're one of those people who absolutely loves their dog and wants to give it the best, and I know there are a lot of people out there who do! This book is all about feeding your four-legged family members the best possible treats for their health...Giving your dog healthful, home-baked treats is a labour of love, but the recipes in this book are so easy and fun to make that you will hardly notice the 'labour' at all! The book has heaps of recipes, many of which are really simple and quick to make, and there are plenty of recipes you can use left-overs from the fridge to complete. The best thing about these recipes? You can try them all yourself, as they are 100% human-safe (well, if the idea of Blueberry & Sweet Potato muffins appeals to you!). I don't have a dog (in fact I've never owned a dog in my life) but I absolutely adore my 2 guinea pigs, so I can see how people love their dogs as much as they do. If guinea's were able to really interact with me like a dog, well, I would be hoping for a Guinea Pig cookbook like this one for dogs! If you know someone who absolutely loves to cook and bake and loves their dog as passionately as they do cooking, then this is a book you should get them/tell then about. You can pick one up from Booktopia for $17.50 (RRP: $19.99). I'm an absolute dog lover and have a JRT/chihuahua mix. I've been trying to find a book for homecooking for her, not only cause i'm a "crazy dog person", but because there's proof that holistic nutrition for your pet can extend their lives. Plus, to be honest, it's a lot cheaper sometimes to just cook for your pet or make your own homemade treats then buy the store brand stuff. Plus, I see it as good practice for kids someday ;) ... here's more info on what to feed your dog http://bit.ly/3CrL3N - they also have good vitamins I like to give my dog.